I've been a volunteer at Facets Multimedia for 22 years this September and I was an avid fan of the Children's International Film Festival long before I had children of my own. Whether you're in charge of introducing your children to world class multicultural offerings, or you're a child at heart, check out the fabulous films and workshops this year. Highly recommended! Three major animation studios, Pixar, Aardman, and LAIKA Studios, have teamed up with Facets' 29th annual Chicago International Children's Film Festival for an exciting array of screenings and workshops during this year's festival, from October 26 to November 4. **LAIKA Studios, the makers of ParaNorman and Coraline, present their "Stop Motion Magic" workshop at Facets Multi-Media on Saturday, October 27, from 1 p.m. to 3 p.m. $25 for Facets members and $30 for non-members. LAIKA will also present special Halloween screenings and events for their most recent hit film ParaNorman at the historic Music Box Theater October 27, at 10 a.m., and the Logan Center for the Arts in Hyde Park October 28, at 6 p.m. Both screenings include a special Q&A with LAIKA Studio's Mark Shapiro and a zombie costume contest for the kids. Adults are not left out! Aardman is also conducting a behind-the-scenes look for adults called "Behind the Genius of Aardman" at Facets on October 28, at 7:00 p.m. Registration is $30. Pixar joins the festival on November 3 for "Tribute to Pixar Animation." This presentation of Pixar shorts and post-screening discussion with a Pixar artist will be at the Music Box Theater on Saturday, November 3, at 9:30 a.m.
Register for all festival workshops here, or by calling 773-281-9075, ext. 3011. Space is limited so registration must be done in advance. The schedule and tickets for every screening are also available at www.facets.org/kids. 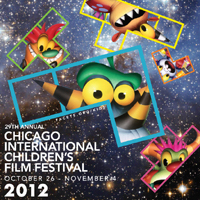 The 29th annual Chicago International Children's Film Festival is October 26 to November 4. It is the largest festival of films for children in North America, boasting over 240 films from 51 countries. This year's Festival includes: short films that bolster English literacy; the annual Tribute to French Animation; and Halloween shorts with presentations, workshops, and costume contests. The Festival will welcome over 23,000 attendees, including nearly 100 filmmakers, who will lead Q&A sessions and workshops at venues across Chicago. The CICFF showcases the best in culturally-diverse, value-affirming new cinema for children and youth, as well as entertaining and educational programs for teachers, parents, and caregivers. The first Academy Award-qualifying children's film festival in the world, the CICFF has distinguished itself over the years with an array of interactive programs and workshops designed for children, youth, and adults. The Chicago International Children's Film Festival is a program of Facets Multi-Media, a nonprofit organization that for 38 years has been dedicated to the exhibition, distribution and education of foreign, independent, and classic cinema.